For over 150 years the Hashknife Ranch has been operated by the same family, from founder William Krönig to fourth-generation head Dogie Jones. The ranch has seen many uses in its time, from a trading post along the Santa Fe Trail, to a farm producing crops such as wheat and oats, to its current status as a day-to-day Quarter Horse operation producing show and ranch horses. William Krönig, Dogie's great-grandfather, emigrated from Germany in 1847 and, after a series of enterprises, found himself in New Mexico as a part of the westward movement to California. Circumstances would prevent him from continuing on to the gold coast, and he enlisted with the U.S. Cavalry, which was operating in the northern New Mexico and southern Colorado region under Colonel Benjamin L. Beall. In his short time in America, Krönig had picked up the English language with ease, making him one of the few who could read and write English in the frontier country and an important asset, evidenced by his additional duty as the Commissary Sergeant. Trusted by Colonel Beall, and being a generally adventurous individual, Krönig was tasked with various covert missions in regard to dealings with the tribes in the area. Upon finishing his duty, Krönig, by the suggestion and investment of a businessman in Taos, opened a dry goods store in the town of Rio Colorado, in northern New Mexico. With this, Krönig got a foot in the door in the mercantile industry, beginning an adventure that would see him move between New Mexico and Colorado as a trader, rancher and farmer. Not long after, and less than 10 years passed since emigrating from Germany, Kroening was appointed the administrator of the estate of Alexander Barclay at Watrous, in northern New Mexico. The fort, which was a fort only in name, was located on the Santa Fe Trail and included a trading post and post office. After finding success as a merchant, and being interested in acquiring the land surrounding the fort, Krönig purchased the fort and built a productive farm that included irrigation and many man-made lakes. After further ventures in the area proved fruitful, and not without his share of failures, Krönig built a mansion at Watrous, known as the Phoenix Ranch House, which still stands today as a private residence. As Krönig aged into his sixties he acquired a large swath of land just south of his original purchase, selling the Phoenix Ranch in the process. Intending to build a house on his newly acquired property, he contracted his son-in-law, Frank Meredith Jones, to design and oversee construction. In the end, a house and structure that would serve as a new trading post were completed. Krönig and his wife moved into the house and lived out their days together until he passed in 1900. Today, this house serves as the headquarters of Dogie's Hashknife Ranch. Upon Krönig's death, the ranch was left to his son, William Krönig Jr. who, unfortunately, was already suffering from rheumatoid arthritis. This ailment caused him to often be away from the ranch in search of treatment, leaving the day-to-day operations in the hands of others, namely F.M. Jones, the architect of the house. During these years the ranch served as more of a farm, growing wheat and oats, and even featured an apple orchard. Eventually, cattle were introduced to the ranch. From a young age, Dogie and his brother, Charlie, worked the ranch as well, though education and world events like World War II would take them a long distance from Watrous. Even Dogie's father Butch, a veterinarian by trade and a veteran of World War I, would often hit the road as a rodeo judge, traveling the major circuits of the day. As a highly regarded judge, Butch would even be called upon to serve in rodeos as far away as New York City and London. No matter the distance, though, they were always drawn back to the ranch. Upon William Krönig Jr's death in 1952, Dogie, who had been working at nearby New Mexico Highlands University as a leatherwork instructor, leased the ranch from his grandmother, Marie, who was now the proprietor of the ranch. At this turn, Dogie made the decision to begin a Quarter Horse operation. Warren Shoemaker, "a legendary Quarter Horse breeder and AQHA Hall of Famer", had a big influence on Dogie entering the Quarter Horse industry. His first stallion was "Mister Cue" out of a Shoemaker mare by the name of "Wyona Cue". Since then, Quarter Horses have been at the heart of the ranch's day-to-day operations, while Dogie has also managed an interest in Corriente and Black Angus cattle in past years. 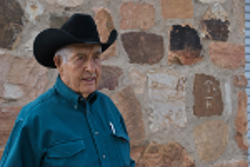 In all of this time, and as the ranch has continued to run a daily operation, Dogie has served as the Director of the Livestock Board of New Mexico, other civil seats, and has even been honored as one of the 2005 recipients of the Foy Proctor Memorial Cowman's Award.